Teaching children right morals and life lessons could be tougher at times when they are on a mood and want take your words as “LECTURES”. This is where you need to play smart and make their little minds feel the fun in your talking! Not quite getting the idea of what to do with this idea of inculcating interest in your kids to talk more with you? I am talking about the Very Short Moral Stories For Kids and won’t make your kids feel bored and learn some more anecdotes about life. That’s how you need to understand your kids and act accordingly. This is a funny story with a really unexpected moral coming out of it. 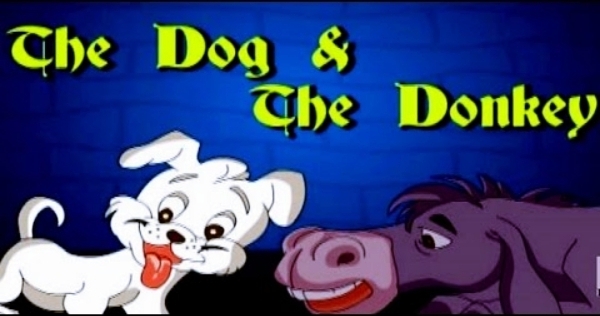 There was a washer man who had two pets; a dog and a donkey. Dog used to keep a watch at house and look to the best of its security while the master used donkey for loading clothes and other such chores. One night, washer man was sleeping and so was his dog regardless of the fact that a thief has entered their house. It was the dog’s job to bark out loud and wake the washer man up. But he was so much lost in the dreams. Though, the donkey was too intelligent and alert to shout out loud scaring the thief to leave everything and run for the hills. Unfortunately, the thief was long gone before the washer man woke up to see the donkey growling. He then beat the donkey badly though he did the right thing. It was dog’s business to look after the security of house and not of the donkey’s. MORAL – Mind your own business. Putting leg into someone else matter may be harmful. Once upon a time, there was a rich man who had a son who unfortunately fell into bad company and began to inculcate bad habits. The rich man became worried and started thinking of solutions to bring his son back onto the right path. After all the efforts he made were kicked into curb, he wisely sat and thought of a plan to teach his son a life lesson. He, then, visited the market and purchased a number of good, fresh apple and also a rotten one and kept them altogether in an almirah. Further asking his son to open the almirah and see the apples. 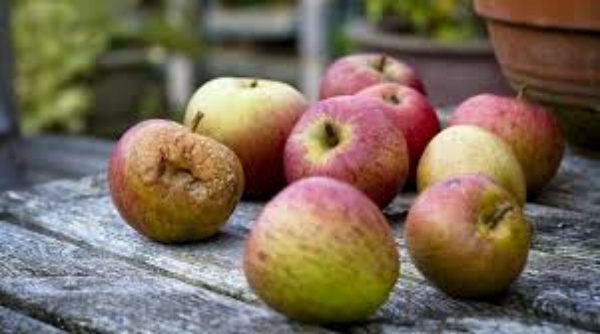 After few days, the rich man again asked his son to check the apples and he was sad to notice that all the apples have been spoiled and wasted. His father, then, explained it to him how one rotten apple spoiled all the fresh ones as well. Similarly, one bad friend could turn your whole group of companions wicked. And the bad boy became the good boy soon! Though, its not just your kids who need to know more but you also need to read some books to understand child psychology as well. MORAL – Living alone is much better than living in a bad company. Once upon a time, there was a blind man who lived in a village. 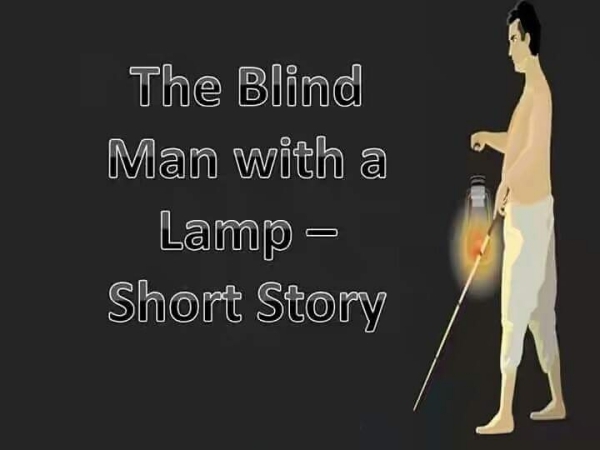 Even though, he was blind he never forget to carry a lighted lamp while he walked at night. The group of men then realized the mistake and begged apology. MORAL – Speaking after thinking twice saves you from getting disrespected and hurting others. The Donkey – Wise or Stupid? Once upon a time, there was a merchant living in a village and he had a donkey. He was a dealer in salt and he used to carry sacks of salt on donkey. Every time he went for a deal, he had to cross that stream to go to other village. While crossing the stream, the donkey accidently fell into the stream and there dissolved all the salt reducing the weight on the donkey. Donkey got an idea and became happy. He then began to intentionally fall into the stream every time he crossed one. His master, though, was wise and he suspected the evil intention of his donkey. Next day, the merchant loaded the donkey with pile of clothes. 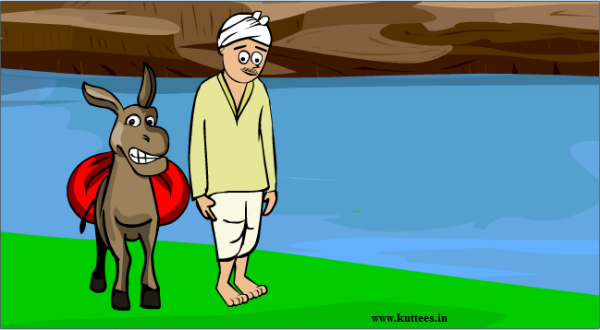 The stupid donkey, again, fell into the stream thinking the weight will reduce. But instead, the clothes absorbed water and became heavier. He got tired and then realized the mistake thereby not falling into the stream like that ever again. MORAL – Befool a person once, but second time it will make a fool of you instead. There was a milk maid who lived in a village and earned her living by selling milk. One day, just as her routine days, she was carrying the pail of milk in a pot on her head heading towards the market to sell the milk. As she when along, she fell into a reverie. She thought that after selling all the milk, she will buy eggs and after chickens hatch them, she will sell them all for a good price. She will then buy beautiful dresses for herself and look more beautiful. Princes will come with marriage proposals but tossing the head in a “NO” to reject their proposal. 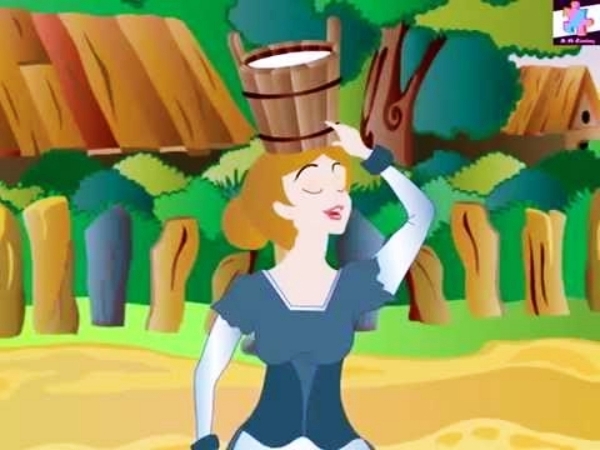 And there she actually tossed her head and there fell the pail of milk. All dreams in vain. Sad girl returned home. MORAL – Dream after you have already work for achieving the aspirations. 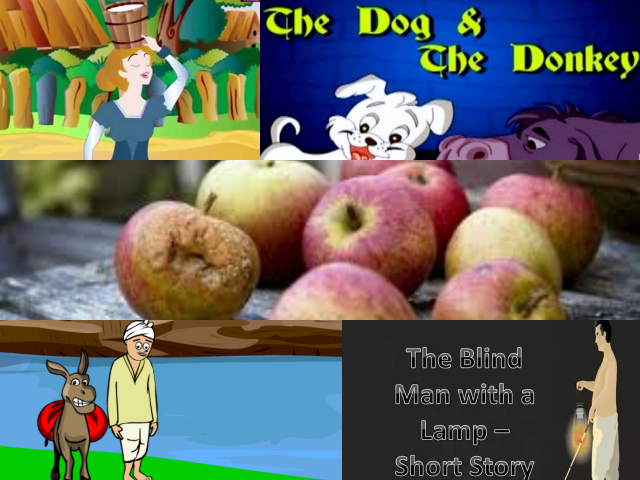 How about teaching your kids some important morals of life with these clever and fun Very Short Moral Stories for Kids? It will make them good human being for sure! Straight way won’t work with naughty kids and you gotta learn these baby hacks to make it fun as well.